I'm not a huge peas fan by any means… To me, they're sweet and mushy and really don't add much to a dish. BUT… when I had this pea pesto that my friend Kathryn made, I've become a convert. It's so yum, pretty to look at and just screams summer with it's delicious flavours. Here you go, pea pesto. Taken from Giada's Pea Pesto Crostini recipe and adapted just a bit. That's it! Giada paired them with crostinis and I've done the same but they also work really well with veggies and nice crackers. Such a simple, healthy, delicious (cheap) summer appie to bring to someone's home. I saw Giada make this and I wanted to try it, but then forgot about it! Thanks for reminding me - it sounds SO good! 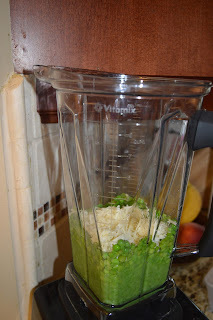 Oh man I'd have never thought to use peas for pesto!! This is great! Looks yummy and so simple to make! What a great idea and i have a whole bag of peas in the freezer. I like that you used cheese to give it some texture and taste! My best friend loves Pesto. I'll be sure to pass it along!